Taranaki Gets a Taste for the FIFA Under 20 World Cup. Recipes from the Food Video. We had so much fun shooting this video to celebrate the fact that there are only two weeks to go until the FIFA U-20 world cup comes to Taranaki! I’m sure there are going to be some blistering matches here in New Plymouth and I for one want to catch as much of the action as possible. If you haven’t seen the video, check it out here. This ends up a bit like a soft version of biltong. It might seem that so much cooking for what is essentially thin strips of eye fillet is overkill but trust me the results are quite beguilingly tasty. First make the Kuli Kuli by grinding the peanuts in a mortar and pestle until they almost form a paste. Squeeze as much oil as you can from the peanuts and then place on a tray and roast in the oven until they are a deep brown colour but not quite burnt. To make the Suya Spice, grind the remaining ingredients in a mortar and pestle until combined. 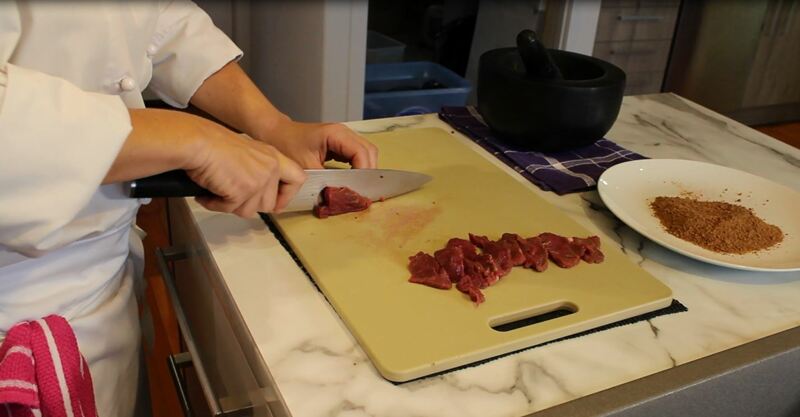 To make the Suya, slice the eye fillet into flat pieces and thread onto a skewer. Liberally press the suya spice into the meat and then allow to marinate for a few hours. Preheat an oven to 150C. Place the skewers on a tray and cook in the oven for around 20 mins. Remove from the oven. Turn the heat up to 200C. Brush the meat with some vegetable oil and sprinkle with a little salt. Place back in the oven for another 5-10 mins to give them a bit of a sizzle. Traditionally Suya is served with fresh tomato and cucumber but I think it’s best just by it’s self. This dish is really simple and super tasty. Preheat a non stick pan on the stove top or have your bbq hot and ready. Season the pork belly with a little salt and lay each strip directly onto the hot pan (or bbq) without adding extra oil. Allow the meat to sizzle and the fat to render. When lucious and golden on each side, remove from the heat and keep warm. 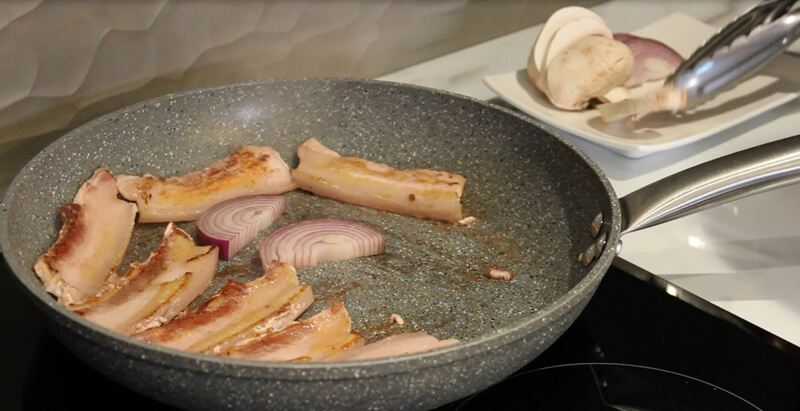 Add the slices of mushroom and onion to the hot fat in the pan and allow to cook until just coloured. To serve: Cut the pork into bite sized pieces and place a few in a lettuce leaf. 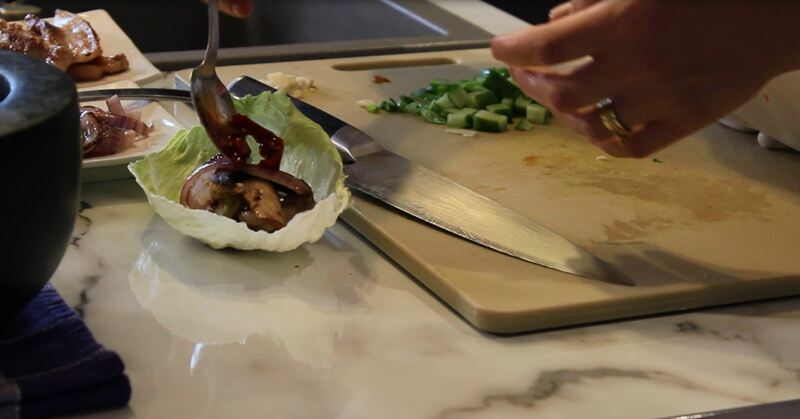 Add a slice of mushroom, some onion, a sprinkle of sesame seeds, cucumber and spring onion. Top with a little of the ssamjang. Roll up the lettuce leaf and eat! note: Ssamjang is a korean chili paste. I couldn’t find any in the shops here in New Plymouth but I made up something similar by grinding some fermented soy bean and chili paste together with a splash of sesame oil and a fresh red capsicum. Man. I’m not going to say this is a healthy dish. It’s good though! The best bit is you can make the dough the day before and let it finish rising in the fridge. Mix all of the dough ingredients together and mix until smooth. 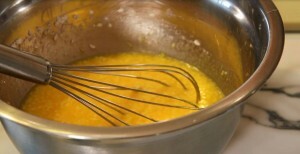 Either by hand or using an upright mixer with a dough hook. Cover and allow to rest for 15 mins. Knead for 1 minute then rest 15 minutes. Repeat and allow to rise (covered) for 1 hour on the bench or overnight in the fridge. Preheat the oil in a deep fryer to 180C. Cut off sections of dough and roll as flat as possible on a floured bench. Cut a slit into the centre of each piece and then drop into the fryer. Cook for 5 mins or until golden on one side and then flip it over in the fryer to cook on the other side. Drain on paper towel. To serve, rub the cut side of the garlic all over the langos. Spread the langos with sour cream and then top with the grated cheese and parsley. Everyone loved this dish and it’s SO easy! Because this is such a simple dessert it relies on the quality of it’s ingredients. If you can, use real vanilla – it makes all the difference. Lightly brush 9 small ramekins with a very thin coating of oil. Mix all the other ingredients together into a bowl and divide among your ramekins. Place the ramekins into a deep tray and pour in enough water to come half way up the sides. Cook for about 20-30 minutes or until they appear golden. Remove the ramekins from their water bath and allow to cool 30 minutes before inverting and serving. Simple! Tip: Run a knife around the sides of your quindim and gently shake free. Feel free to add your comments and questions below. To extend the fun, Cook Learn Love will be conducting some Kids Cooking Classes for the July School Holidays based around these dishes so stay tuned for more details. Helen is known for her own style of refined yet approachable French Cuisine, and of course, ever smiling face behind the pass! Now living in New Plymouth, New Zealand, with her husband and young family, Helen is excited to be able to share her knowledge and passion with her students. She will no-doubt acquaint you with some of the hidden gems of produce found from Taranaki as she has a fervour for local produce and loves to discover the people and stories that bring paddock to plate. 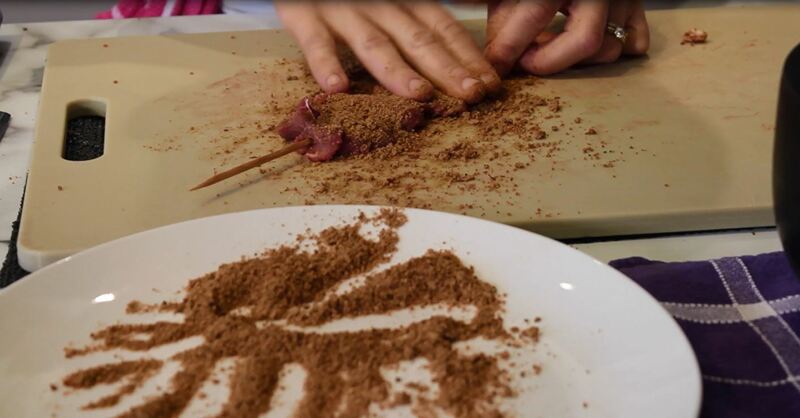 School Holiday Kids Cooking Class with Simone’s Plant Based Kitchen.